You’ve probably seen me talking about Beverly Hills Chihuahua 3, Viva La Fiesta a lot lately. What can I say, when I like a movie, I like to spread the word about how great it is! Beverly Hills Chihuahua 3 Blu-ray combo pack was released in stores for sale today! YAY! To celebrate the release, I wanted to share some fun stuff with you. 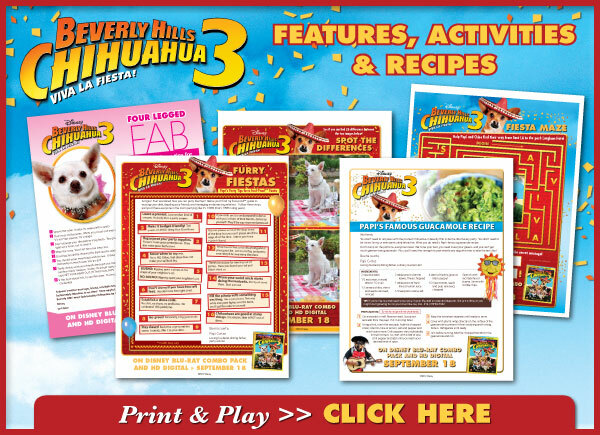 You can access all kinds of cool activities and even Beverly Hills Chihuahua inspired recipes! I thought I’d share a little bit of Q & A with one of the movie’s human stars, George Lopez, who provides the voice of Papi. Q: WHY DO YOU THINK THIS FRANCHISE IS SO POPULAR WITH AUDIENCES OF ALL AGES? GL: Well, first of all, it has the greatest name—“Beverly Hills Chihuahua.” Everybody loves dogs. They’re way over the top about dogs. They dress dogs. They take pictures of their dogs. They have dog screen-savers and wallpaper and lock screens and they’re on Christmas cards and they sleep in your bed and they’re everywhere you go. People travel with them. They fly first class. I waited my whole life to fly first class and there are dogs in first class! And not in a kennel, just loose. They’re in their chair, but also half in mine. I’m like, hey man, I waited all these years to fly first class, get on your own side! Q: TELL US HOW YOU FEEL ABOUT BEING PART OF MOVIES THAT THE WHOLE FAMILY CAN WATCH. Q: PLEASE TELL US HOW STARRING AS PAPI IN THE “BEVERLY HILLS CHIHUAHUA” FILMS HAS CHANGED YOUR LIFE. GL: Since I started this franchise I’ve met every Chihuahua owner and held every Chihuahua on the planet. So I’ve seen different shades and colors and ages from calm ones to super hyper ones. I’m Papi. If you have a Chihuahua, you’ll bring it over to me and let me hold it. I take it as a mark of a job well done. Stay connected with the latest news and information about the Beverly Hills Chihuahua 3 Blu-ray Combo pack ! I really loved this movie. Beverly Hills Chihuahua is one of those movies that your kids will watch over and over and over again – and you don’t have to feel bad about it, because the movie is so wholesome and has such a beautiful message! And your kids CAN watch it over and over and over again…because I am giving away a Beverly Hills Chihuahua 3 Blu-ray Combo pack ! Giveaway is open to US residents and closes at midnight, September 30th, 2012.
tweeted @mrspoofa-your site will not let me paste url in comment??? I follow @Disney pictures on twitter @mrspoofa. My girls would LOVE this movie. They loved the first two, so this would be great!! I left a comment at-Try This Banana Split Bread Recipe! My son wants to see this movie – I would love to win! I want to win!!! Love these movies! I would love this for my girls thank u! I would love to win this for my son who loves dogs!! Cute movie! Thanks for the chance to win! 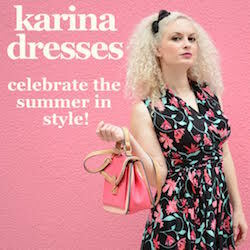 wanna win for my neice! My 3 girls love any movie that has dogs in it and they especially love the Beverly Hills Chihuaha series!